Glutovi loves nothing more than eggs. Searching far and wide it keeps record of all the nests nearby, monitoring the habits of both parents. It waits patiently for a chance to steal a precious, delicious monster egg. It keeps the sling of eggs around its waist fully stocked at all times. Nothing is more exciting for Glutovi than finding a large egg. Any egg too large for Glutovi's pouch will be lifted, then eagerly shovelled into its flexible, unhinging mouth, leaving this monster filled with delight. Unfortunately for Glutovi, the larger the egg, the more powerful the parents often are. While teenage hooligans often find the practice of locating large, round rocks, painting them white, and then leaving them in Glutovi's path a hilarious exercise, when Glutovi discovers the true nature of the false egg it will often begin a rampage that can easily maim humans. 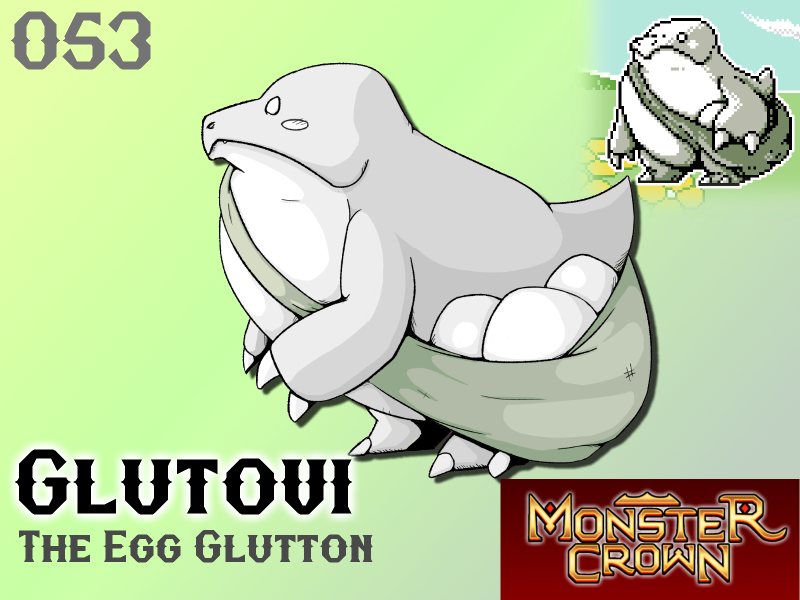 Glutovi's moveset contains egg-hurling attacks that can increase the monster's speed from the shed weight, egg-eating moves that restore HP as well as defensive egg-based moves. Glutovi can make a well rounded addition to any team in need of a Will type monster. Will Glutovi make your team?